Rumors of the M1005 Stresemann began early last year and it was widely expected that we would see it hit the market sometime in late 2018. The year came and went without such an announcement suggesting that the release had been pushed back with a new estimated arrival set for the first quarter of 2019. The wait is now over as word of the upcoming M1005 Stresemann finally broke today from the Netherlands courtesy of our friends at Appelboom. This new model will join the M805 (2015) and the M405 (2016) in the same finish. The M1005 will be the largest model to sport the anthracite stripes and is a welcome addition to a line that hasn’t seen a refresh in some time. The last M10xx model not host to an ultra limited Maki-e or Raden finish was the M1005 black released seven years ago in 2013. In case you’re new to the blog or brand and may be unaware of the origins of the Stresemann finish, allow me to explain from where the designation derives. The former foreign minister of the Weimar Republic and Nobel prize recipient, Gustav Stresemann (1879-1929), had a proclivity for wearing suits with thin stripes which became something of a defining trait. After a time, people started drawing parallels between Pelikan’s now well-known striped pattern and the Stresemann look resulting in the nick-name that has persisted to this day. It was nearly two years ago that Pelikan announced the M805 Stresemann. That model was very well received but many in the community lamented the fact that the finish was only available in an M8xx sized pen. Those hoping to see the anthracite binde in a different sized Souverän just got their wish. 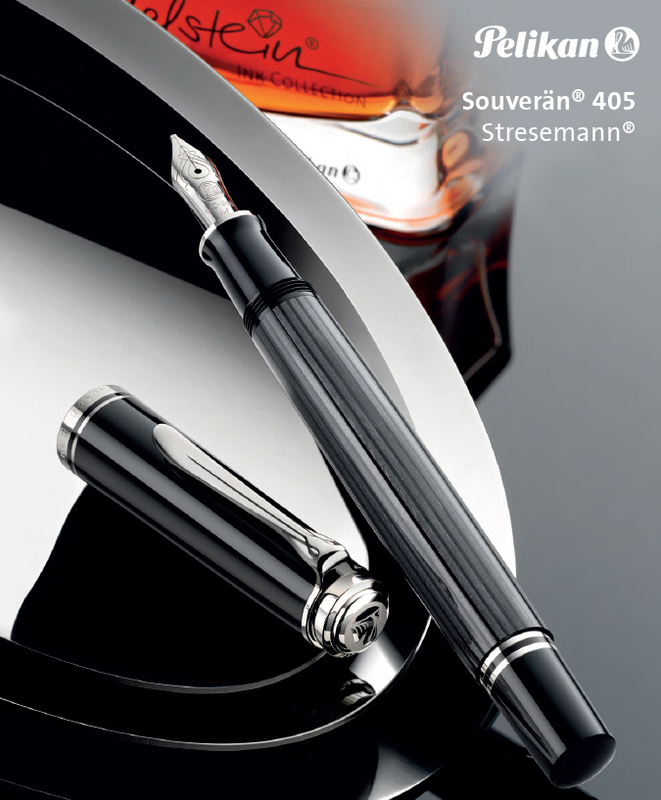 Several vendors today broke the news of a forthcoming Souverän M405 Stresemann. Similar in appearance to its bigger brother, the M405 will bring the anthracite finish to a whole new group of consumers. For those of you not familiar with the Stresemann moniker, it is a term that has been used to describe the Pelikan pen’s classic pinstripe appearance. It is the nickname of the Souverän series and was derived from the Secretary of State of the Weimar Republic, Gustav Stresemann. He was well-known for wearing black/grey striped trousers and a jacket in black or anthracite. 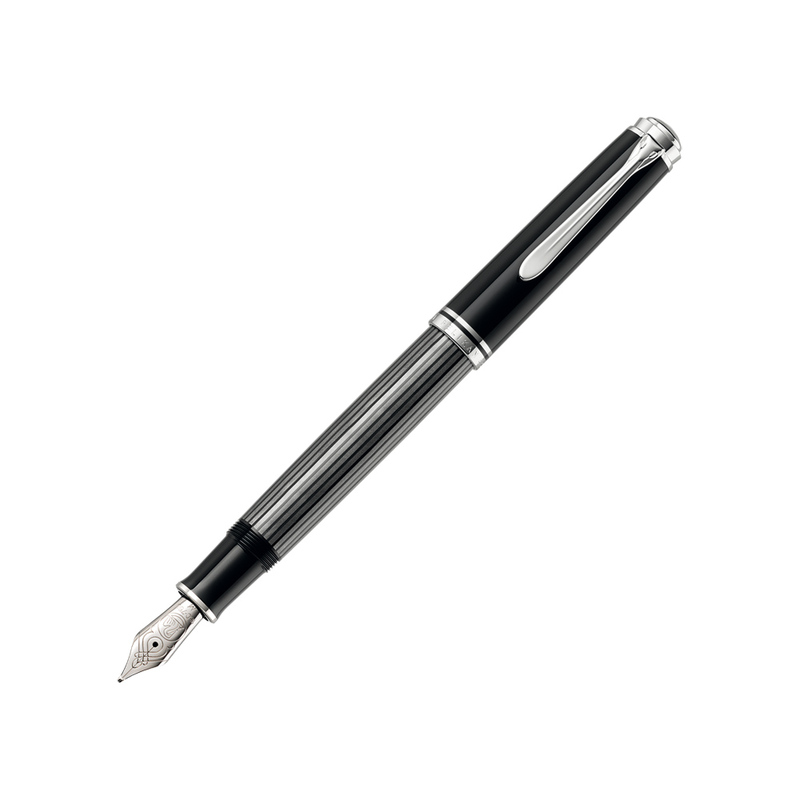 Pelikan’s M805 anthracite Stresemann has been out for a few months now and reviews have steadily been cropping up. 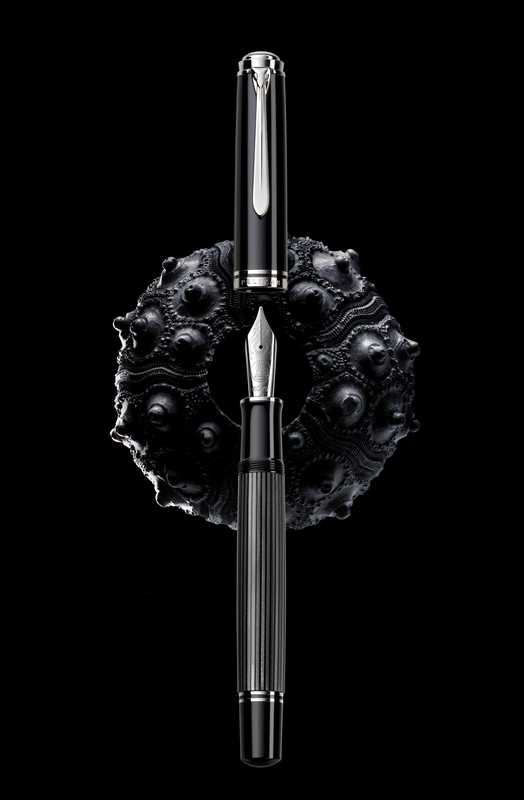 To those other voices, I would like to add my own take on this pen. I have had the opportunity to use the Stresemann for the past three weeks as my continuous every day carry along with the companion K805 ballpoint. While my experience has generally been positive as you will read below, there were some small inconveniences that, while not deal breakers by any stretch, did hinder my full enjoyment of the pen. To be upfront, this pen was provided to me as a loan by Pelikan themselves and will be returned to them after this review (the first such occurrence for this blog). That said, this article was not subject to any censorship nor do I feel a loaned pen has had any impact on my objectivity. Still, I provide that information to you at the start in order to allow you to better draw your own conclusions. I think that the most striking thing about this M805 is how Pelikan took a somewhat drab color and really elevated it to another level. This pen stands out in the M8xx line up in a unique way and will be hard for many to pass up. Unlike so many special edition releases that disappear once the production run has ended and stock is sold off, the Stresemann is reported to be a regular production model. If you don’t have the funds for one right now, it seems as if they will be around for the foreseeable future. I know many hope that this color bleeds into the other Souverän lines and based on my experience with the M805, that would be a very welcomed occurrence. Unfortunately, only those in Hannover know whether that will ever become a reality or not. While we can only hope for now that this pattern will translate to the other lines, read on below to find out how the Stresemann does the M8xx line justice. 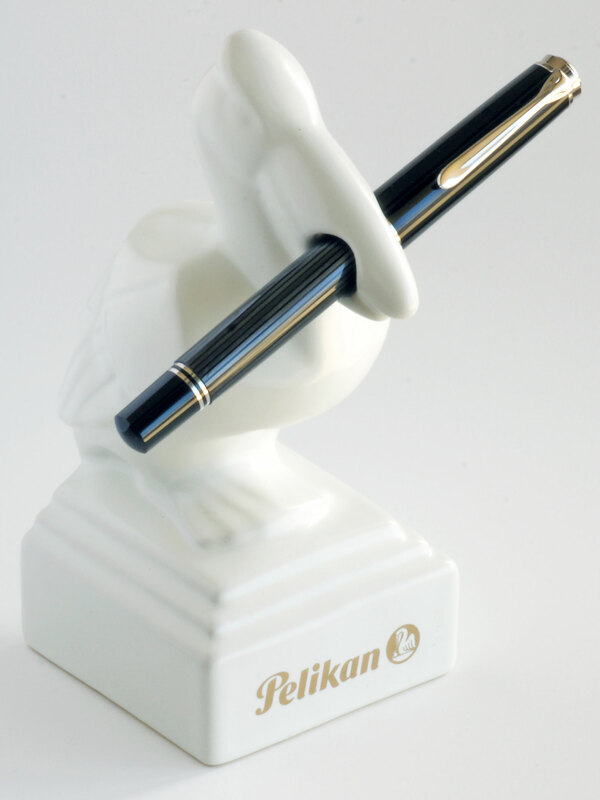 In the early morning hours of Saturday, December 13th Pelikan announced to the community via its Facebook page for Pelikan International that something new was coming. It was described as the reinterpretation of a classic and an image of just the silhouette of a pen was provided with a short caption. Of course, this generated no shortage of speculation and commentary throughout the weekend. I saw quite a range of guesses as to what was in store, many of which seemed to be hoping for some new variation of tortoise. Thankfully, Pelikan did not keep us waiting for long and, just 48 hours later, they have made the announcement that in 2015 they will be releasing an M805 with a new binde (pronounced BIN-duh) dubbed Stresemann. Binde is a German word that describes the colored/patterned sleeve that is fitted around the outside of the barrel of a pen. It is more of a historical term as the old birds had a barrel with a separate binde to provide the coloration. I believe that this is still the case though for the M8xx series and up but does not hold true for the smaller Souveräns.